Here is a little more detail about some of the BIMBY. A number of years ago, I discovered BIRD WATCHING. I started by finding out WHO was in MY BACKYARD. I purchased a number of birding books and figured them all out. They are called the BIMBY. I hope you enjoy them. If you are interested in purchasing any one of them e-mail me and I will see what I can do. I have originals of some which would be priced similarly as the above. 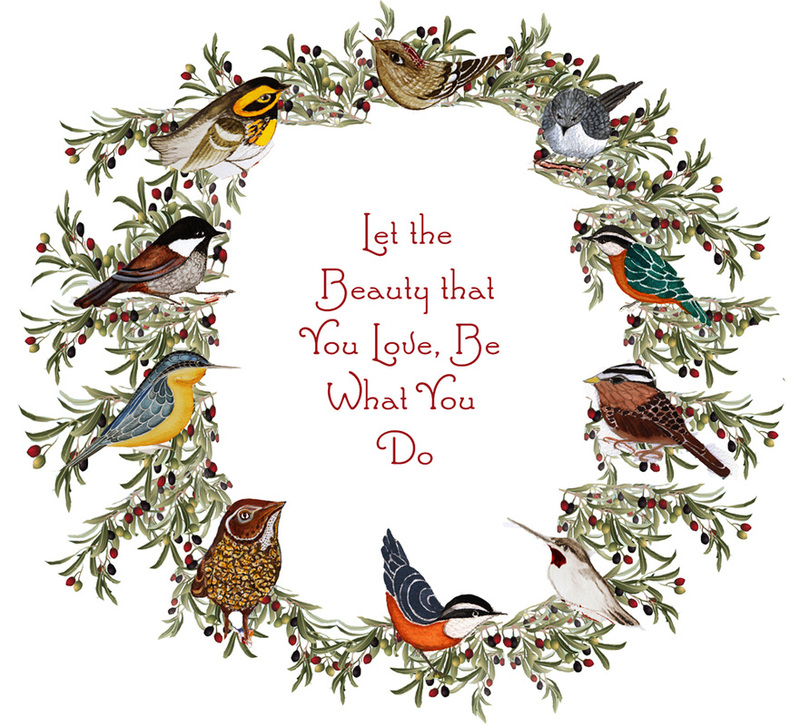 I have a fountain in my back yard that one day attracted all these little birds at once. I was in heaven. I have tried to keep true to their sizes relative to each other. 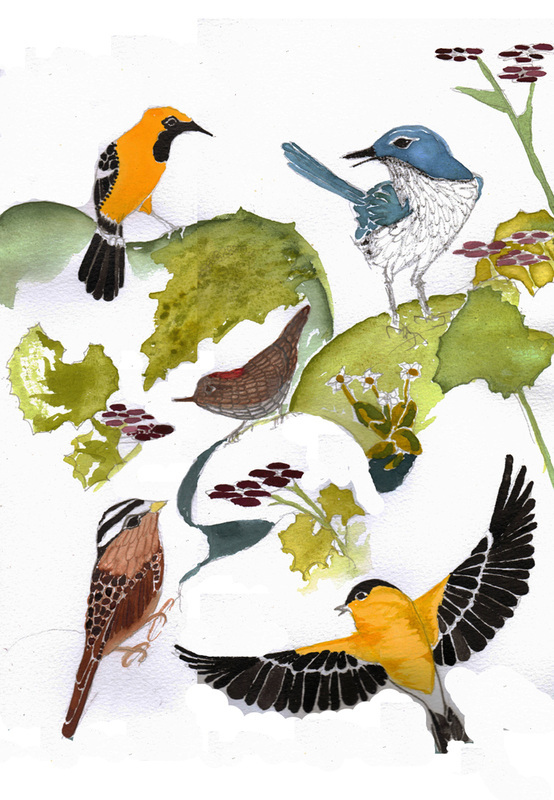 From top left clockwise: Hooded Oriole, Scrub Jay, American Goldfinch, White Crowned Sparrow and Ruby-crowned Kinglet in the center. Original WATERCOLOR is 9X12. Double-matted and FRAMED in 16" X 20"
GICLEE' 8 X 10 No Matting $25.00. GICLEE' 8 X 10 Double Matted $75. Framed, double matted Giclee' is $165.00. 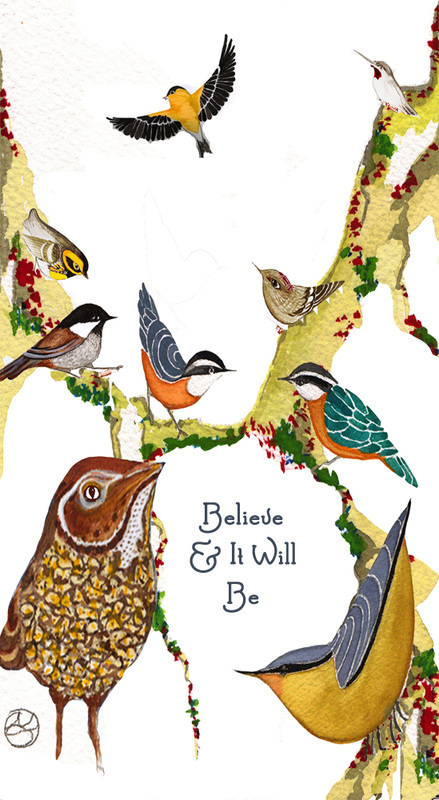 The BIMBY WREATH is a DIGITAL COMPOSITE of nearly ALL my Birds In My Back Yard. 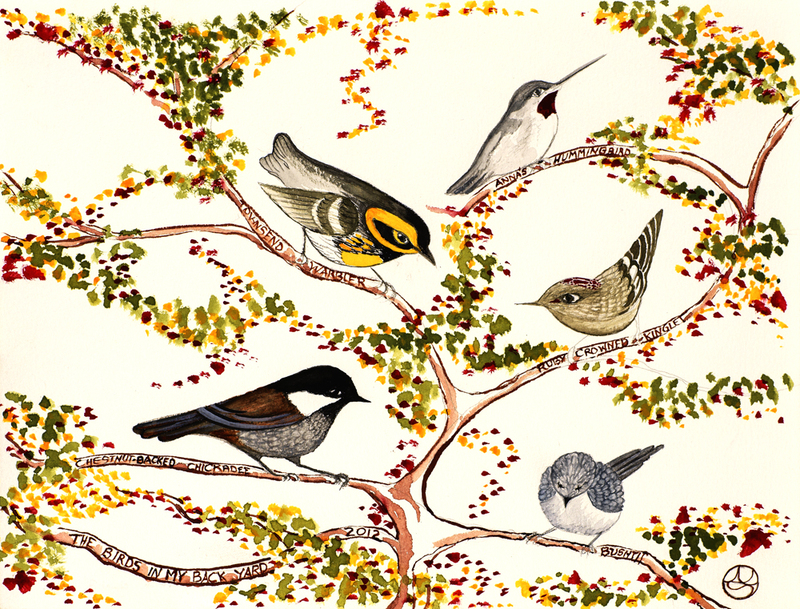 From top center clockwise: Ruby-crowned Kinglet, Bushtit, Redbreasted Nuthatch, White-crowned Sparrow, Anna's Hummingbird, Red-breasted Nuthatch, Hermit Thrush, Red-breasted Nuthatch, Chestnut-backed Chickadee and Townsend Warbler. This design is used in greeting cards, covers of sketch pads, totes, etc. I also do a Giclee' of it if you are interested. 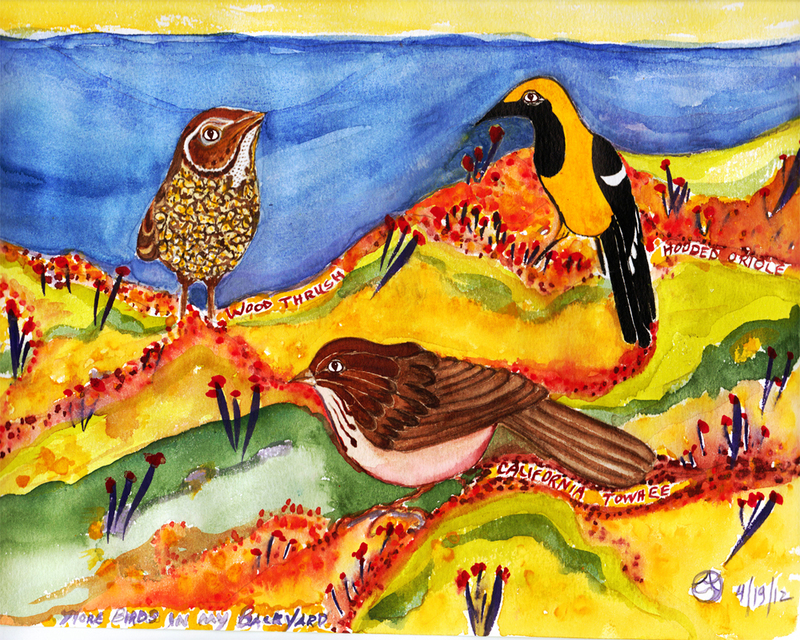 BIMBY Mountain is a DIGITAL COMPOSITE of many of my little birds: chestnut backed chickadee, red-breasted nuthatch, hermit thrush, goldfinch, and Anna's Hummngbird. This design is used on cards, book covers, T-Shirts, etc. This was the first of my BIMBY watercolors. All these birds regularly frequent my back yard. Clockwise from top left: Townsend Warbler, Anna's Hummingbird, Ruby-Crowned Kinglet, Bushtit and Chestnut-backed Chickadee. Original is 9" X 12". Original WATERCOLOR is 9" X 12". Matted $75. Framed, double matted Giclee' is $165.00.